Home MTAANI NEWS 100 families left homeless after inferno guts down homes. 100 families left homeless after inferno guts down homes. The aftermath of the fierce inferno that razed down 97 houses in Umoja Estate Thika. 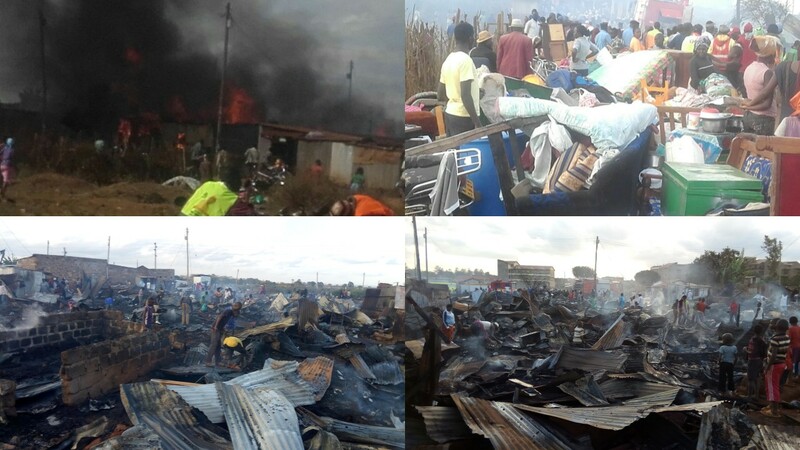 97 families were left homeless after a fierce fire gutted parts of the sprawling Umoja Estate in Thika’s Hospital Ward, destroying about a hundred informal settlements made of mabati and timber. Residents grabbed what they could and ran for cover, while others who returned from work were shocked to see their homes go up in flames. The cause of the fire is still a mystery as there were conflicting theories from the residents we interviewed. Some residents said the fire was started when a stove was left unattended in one of the shacks while others blamed it on an electric fault that had been witnessed from one of the KPLC poles for the last few days. Other than a few injuries inflicted in the process of putting off the fire, all people could be accounted for. Resident Jane Njoki said it was just after 3pm when she saw the flames. She added that the blaze quickly ripped through the houses and spread, damaging homes in all the adjacent plots. She claimed that the smoke from the blaze poured hundreds of feet into the evening sky. “It happened so quickly. In about five minutes, a lot of shacks were burning. It was really terrible. We saved whatever we could before we had to get out but majority of my neighbours lost everything. The heat was so intense,” she said. She added that streets surrounding the blaze basically impassible at the time of the fire. Another resident who works in a nearby quarry said that he saw a cloud of smoke over the settlement. “I just left everything and ran home. But when I got there, I saw my home go up in flames. The fire took it and everything I owned. I’ve got nowhere to go,” he said. Fire fighters from the County Government of Kiambu and the ICT Company were immediately dispatched to the scene for the rescue mission. It took them more than 2½ hours to completely contain the deadly flames. Hundreds of onlookers gathered nearby to watch as firefighters battled the blaze. Thika West OCPD Willy Simba confirmed that there were no casualties and investigations to ascertain the cause of the fire were underway. “We have not really established the real cause of this fire but my officers are on the ground trying to gather necessary information that will help us ascertain the cause of this fire. Luckily, we have not lost anyone in the fire,” said the OCPD. He assured the residents of police security as the process to temporary relocate them for the night was being arranged. The Thika Branch Red Cross and members of the Jungle Foundation led by the Thika MP-Elect Eng. Patrick Wainaina Wa Jungle made frantic efforts to ensure that the affected families had a place to sleep for the night before a comprehensive programme was put in place to relocate them. Women with children and the elderly huddled in groups as the disaster management personnel and firefighters cordoned off the area. They later secured the Umoja Social Hall and a nearby children’s home where the victims spent the night.